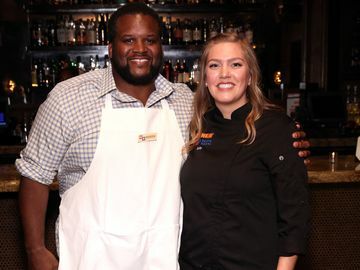 Father’s Day is this weekend, meaning people everywhere are racking their brains for a unique gift idea for Dad. Finding a perfect gift can be challenging, especially if you want it to be original. 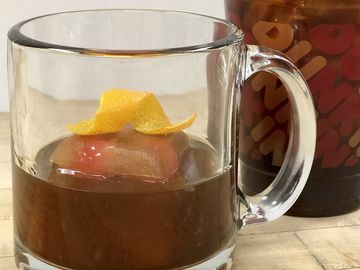 Sometimes the best way to be unique is by playing off the basics, which is why we’re putting a Dunkin’ twist on some Father’s Day gift classics. Now, you can go above and beyond for Dad, without any headaches! Dads may not admit it, but everyone loves being told they’re the best. Father’s Day is a popular time to tell Dad this by gifting him “#1 Dad” coffee mugs, t-shirts, mouse pads, etc. 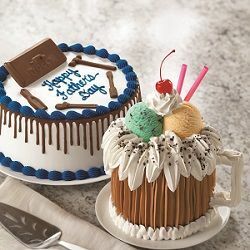 This year, Dunkin’ Donuts is offering a DDelicious way to let Dad know he’s the best, by offering the #1 Dad Donut, which is available at participating Dunkin’ Donuts restaurants through Father’s Day. This mouth-watering donut, pictured above, is a star-shaped yeast donut with Bavarian crème filling, chocolate icing and a white icing drizzle. 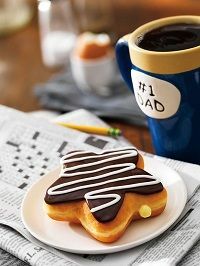 Pair this donut with any #1 Dad gift and he’ll be sure to get the message. 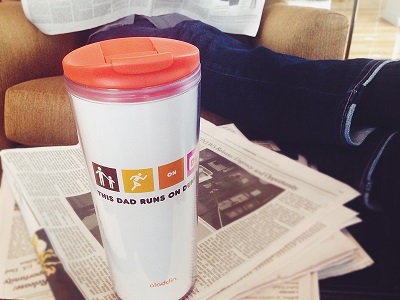 Another great pairing for the #1 Dad Donut is our “This Dad Runs on Dunkin’” tumbler. This is a great gift to help Dad enjoy his fresh-brewed coffee at home or on the go. The 16-ounce tumbler is top rack dishwasher-safe, and will help keep Dad fueled while at work or play, all day long. Bringing your golf-fanatic Dad out on the course is a classic Father’s Day activity. One “legendary” way to get Dad even more excited about hitting the links is by picking him up a Frozen Arnold Palmer Coolatta®. This refreshing new way to enjoy the original half iced tea, half lemonade beverage is great to get Dad feeling like a golf pro, even if his game doesn’t quite match up. 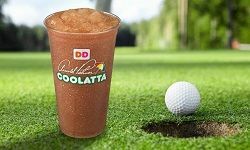 Pairing the Frozen Arnold Palmer Coolatta with other golf products like new clubs, golf shoes or golf clothes is another great way to go that extra mile. Wallets are one of Dad’s only accessories and he’ll usually go years without getting a new one, making this a popular gift item for Father’s Day. If you’re planning on upgrading this accessory for him this year, go one step further and fill it with a Dunkin’ Donuts card. This is the gift that keeps on giving. 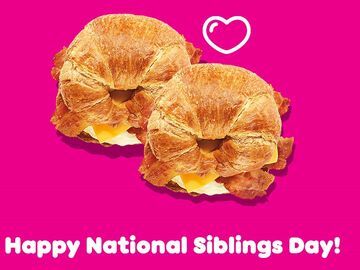 Another option for the tech-savvy Dad is to gift him limited-edition Father’s Day virtual Dunkin’ Donuts Mobile Cards, available in several “Dad-tastic” designs. 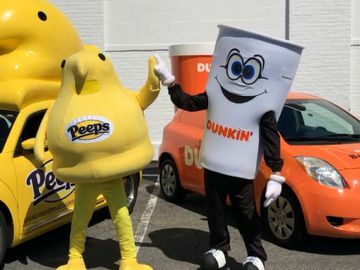 Dunkin’ Donuts Mobile Cards can be easily sent via email, text message or Facebook through the mGift feature on the Dunkin’ Donuts mobile app. You can even write him a personalized message right on the card. This is also a good stand-alone gift if you won’t be able to see Dad this Father’s Day. 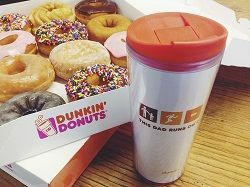 All five of our Dunkin’ Father’s Day ideas can be used as stand-alone gifts as well. Sure, they’re great additions to the classics, but for most Dads, just getting a small token on Father’s Day is enough. 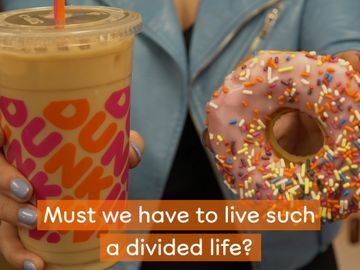 Let us know if you ended up giving your Dad a Dunkin’ Donuts gift this Father’s Day and share his reaction with us on Facebook, Twitter and Instagram. Happy Father’s Day!